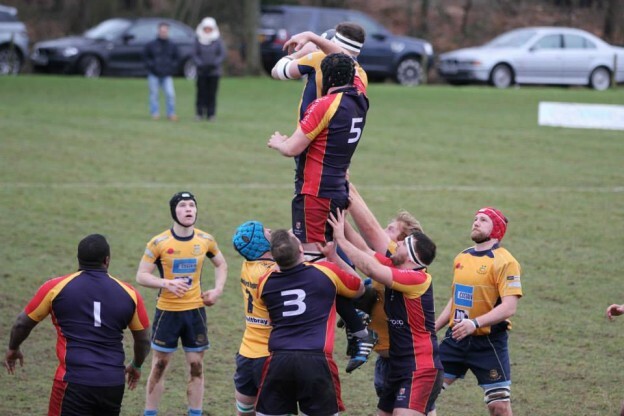 The week off had allowed the Surrey locals tongues to start wagging as rivals Chobham and Guildford locked horns for a mouth-watering clash at Broadwater Park. Both sides were in the promotion mix with Chob coming into the game on a 7 match winning streak although G’s had started to wobble with back to back losses. It was clear that to keep in touch with league leaders Wimbledon, a victory was very important to both sides. With Chob having sneaked the win at Fowlers Wells in October the mood in their camp was positive. The players were also buoyed by the “Chobham Army” who descended on Broadwater in their masses complete with drums, trumpets and megaphones-what an atmosphere, the whole village must have been there! Despite the recent poor weather, the playing surface was in reasonable shape although a cold and blustery north wind blowing down the pitch brought a sharp chill to the afternoon’s proceedings. With the opening minutes being played in midfield as both sides tested each other’s defences, it was the visitors who struck the first blow on 6 minutes. The ball found right wing Aaran Mawson and with space in front of him his chip over rebounded off an attempted Guildford charge down and he collected the ball to sprint in from 30 metres. Alex Seers added the conversion. Guildford 0 Chobham 7. Two minutes later Mawson repeated his try scoring. Again with acres of space in front of him his nudge through bounced perfectly for him to re-gather and score under the posts. Seers added two more from the tee. Guildford 0 Chobham 14. What a start for the visitors and how would G’s respond? The answer was quickly. With only 10 minutes played the third try of the afternoon was scored by the hosts. With a lineout deep in the Chobham 22, the men in yellow executed a well driven catch and drive and James Kirk burrowed his way over for the score. Jarrod Adam added the extras. Guildford 7 Chobham 14. The game then reverted to type with centres Tony Paul and Ben Sims muscularly marshalling the Chob defence as the busy Ben Barrow looked for opening for G’s. Both Seers and James Dunne were intelligently pushing the hosts back with booming touch finders and on 35 minutes Chob extended their lead as the assured Seers struck from the tee. Guildford 7 Chobham 17. On the stroke of half time, Seers struck again as the G’s discipline faltered. Guildford 7 Chobham 20. Coaches Ryan Gregory and Tony Paul would have been very pleased with the look of the scoreboard and the fact that they had not allowed Guildford to create any real threat outside of their set piece. With discipline holding firm the objective would be to put together more phase play to create some further try scoring opportunities. The second half started well for the visitors as another Seers penalty bisected the uprights to extend their lead. Guildford 7 Chobham 23. But back came Guildford who simply refused to lie down. On 50 minutes Chob didn’t clear their lines and the ball was turned over allowing Barrow to touch down for the score which Adam converted. 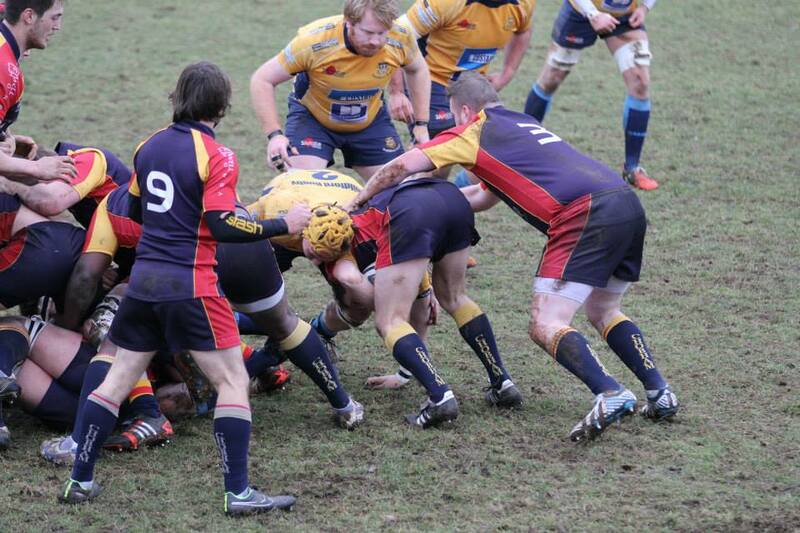 Guildford 14 Chobham 23. There was then a short injury delay whilst prop Lee Evans was stretchered off with a neck injury which happily after a hospital visit was just a precautionary measure and it was the hosts who returned to play looking sharper and with real urgency in their play. On 52 minutes, Adam reduced the gap with a penalty that just had the legs to go over. 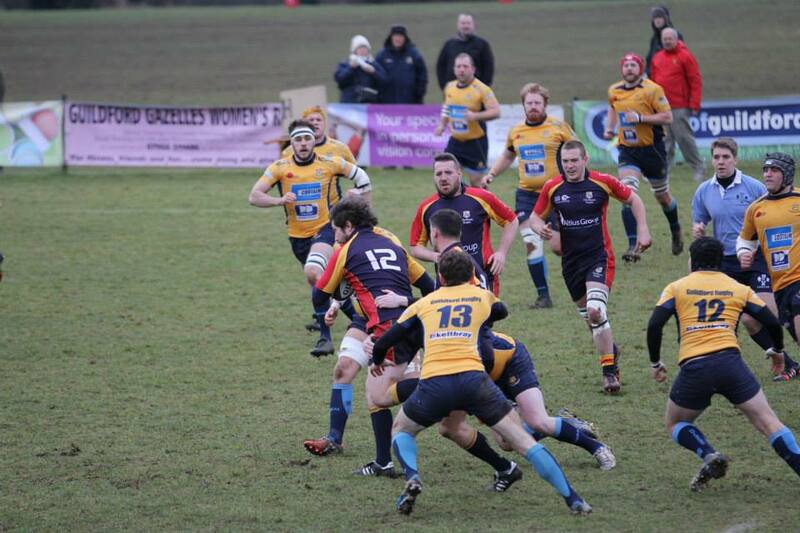 Guildford 17 Chobham 23. The gap narrowed even further on 57 minutes when wing Stu Phillips was sent clear to score. No conversion. Guildford 22 Chobham 23. One of the most positive aspects of Chob’s play all season has been their ability to stay on course and not panic when things get tight. This was a great example as the visitors having absorbed G’s pressure then started to spend time in the visitors 22. With Ollie Smith getting over the gain line, G’s discipline cracked and Seers was given two further opportunities from the tee which he duly took and this nosed Chob away from Guildford to take a well-deserved victory. Full time; Guildford 22 Chobham 29. This was rugby at its most rugged. A hard fought game with neither side giving an inch with the match itself bearing many similarities to Chob’s last visit here almost two years ago when a victory for them secured the league title. Chob deserved this win with quality of their all round play and tactical nous always looking more threatening than G’s set piece strength. With a small gap now opened up on the chasing pack, Chob have consolidated their second spot. 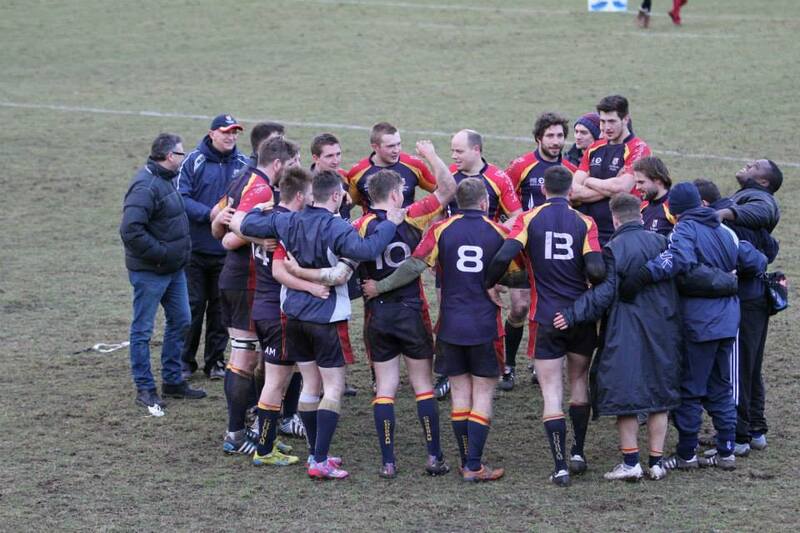 With the unbeaten run stretching to eight Chob return to Fowlers Wells next week in confident mood where they will take on local rivals Cobham whose form of late is much improved. Another interesting encounter is on the cards as the season starts to move into a defining phase.